This time I’m not cheating! 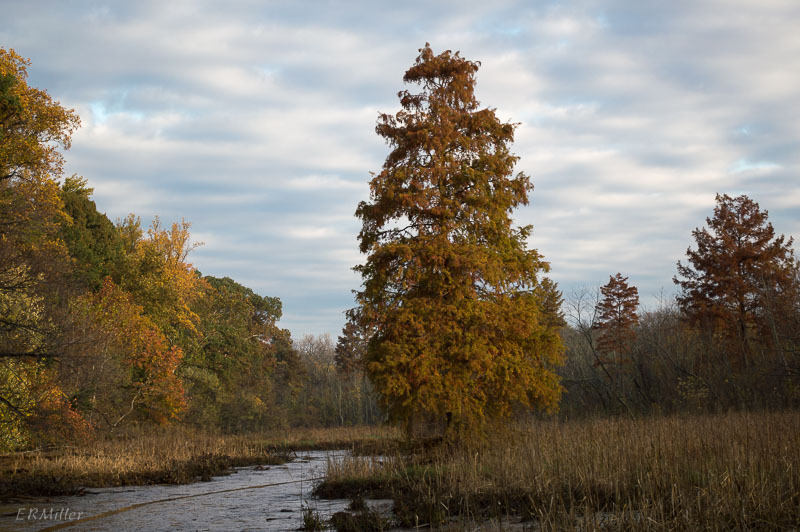 The bald cypress is actually found in the Potomac gorge, though just barely: there are a few stands on Theodore Roosevelt Island, which is at the southern (downstream) end of the gorge, well within the Coastal Plain region. The USDA lists bald cypress occurring from Texas to New York (threatened in Indiana), but according to the US Forest Service, it’s a tree of the Atlantic and Gulf coastal plains (and inland in the Mississippi river valley), growing no further north than Delaware. Either way I was tickled to find a few specimens so close to home. The bald cypress is a large, long-lived tree. The tallest known is 145 feet tall and almost 18 feet in diameter. The oldest known specimen (located in North Carolina) is believed to be more than 1,620 years old. 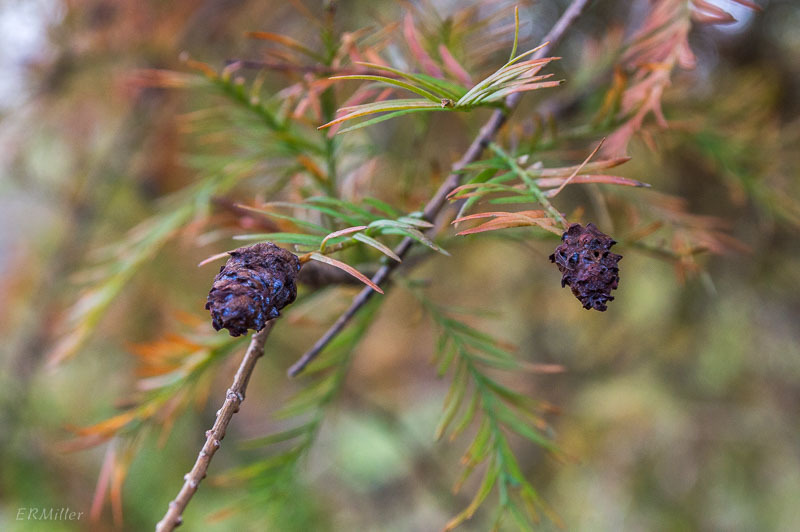 There are two other species of Taxodium (or not, depending on which taxonomist you’re consulting). All three are native to the southereastern US and found nowhere else in the world. An unusual thing about bald cypress: it’s a deciduous conifer. In conversation people often misuse the terms “conifer” and “evergreen”, possibly because most conifers are evergreen. But not all evergreens are conifers – not even close. Let me explain…. Conifers are cone-bearing trees: pines, spruces, firs, junipers, and so on. They have characteristically scale-like or narrow leaves called needles. The words “evergreen” and “deciduous” describe the way trees hang on to their leaves. Deciduous trees shed all their leaves at about the same time – usually during the autumn, sometimes (as with American beech and some species of oak) during the winter. But regardless, each leaf lasts for only one year. Evergreen trees shed some leaves every year, but each leaf stays on the tree for several years before falling off. Most needle-leaved species are evergreen, but there are a large number of broadleaf evergreen plants, like southern magnolia (Magnolia grandiflora), some viburnums, cherrylaurel, rhododendrons, live oak (Quercus virginiana). And some plants might be either deciduous or evergreen, depending on where they’re growing. Sweetbay magnolia is one example. As for deciduous conifers, there are only a few: the dozen or so in the genus Larix (the larches), the three in Taxodium, and Metasequoia, Pseudolarix, and Glyptostrobus (each of these genera contain a single species). So that’s only 14-21 species of trees worldwide.